Northbound Virgin Trains Pendalino heading north leaving Stowe Hill tunnel of the West Coast Main Line south of Weedon Northamptonshire at about 125mph. The modernisation of the West Coast mainline cost £9 billion and was intended to facilitate significant increases in train speeds. There were high hopes for the project at the outset including ambitious plans to run trains at up to 140 mph. The project has undoubtedly delivered significant improvements but it has also served to illustrate the limits of how far you can go in terms of upgrading Victorian infrastructure. It has not proved possible to attain this speed for the purposes of everyday operating; a major factor has been the failure to develop a viable signalling system. Rather than providing an alternative to investment in brand new high speed railways, the project has served to illustrate the necessity for HS2. The claimant owns farmland in Northamptonshire under which the West Coast mainline passes through Stowe Hill Tunnel. In 2001 he entered onto a licence agreement with Railtrack plc (predecessors of Network Rail Infrastructure Ltd (hereinafter NRIL) to facilitate the construction of a pressure relief shaft. Increasing train speeds in tunnels exacerbates the ‘piston effect’ by which air in front of the train is compressed and forced along the tunnel under pressure. Aside from impairing the performance of the train the pressure can also cause aural discomfort to passengers. Pressure relief shafts dissperpate the pressure at various points along the tunnel; Stowe Hill Tunnel required the construction of four such shafts. Some time later, and after the shaft had been built, Network Rail used its compulsory purchase powers under the Transport and Works Act 1992 to acquire ownership of the site and to secure an access route for maintenance: Network Rail (West Coast Main Line) (Stowe Hill) Order SI 2006/3471 (hereinafter the 2006 Order). At this point it should be noted that, prior to entering into the afore-mentioned licence agreement with the claimant, NRIL had contemplated using its compulsory purchase powers under the Network Rail (West Coast Main Line) Order SI 2003/1075. This is the main instrument authorizing works pertaining to the West Coast Main Line Modernization Programme as a whole and contains general powers to that end. The claimant was dissatisfied with the compensation received and appealed to the Lands Tribunal. The claimant represented himself but managed to formulate some legal arguments which, although somewhat tenuous, required a degree of effort and thought to refute. The claimant constructed a somewhat inventive legal argument in an attempt to circumvent the principle in this case and establish an alternative basis for calculating compensation. His argument started on the premise that the acquisition of his land had been tinged by fraud from the outset. NRIL had never had any serious intention of running trains at 140mph and the acquisition of the land was not necessary for the completion of the project. He claimed that this amounted to fraudulent misrepresentation and the only reason he had agreed to the original licence agreement was to stave off the threat of the use of compulsory purchase powers. As such the construction of the shaft on his land amounted to a breach of his human rights and in particular article 1 paragraph 1 on the right to property. Had Network Rail not subsequently used its compulsory purchase powers to acquire the land outright he would have been in a position to seek an order requiring the removal of the shaft. NRIL’s true purpose in acquiring the land was to avoid the colossal expense which would have resulted from the granting of such an order. Thus, given that NRIL did not actually need the land for the stated purpose of maintaining the shaft built pursuant to the earlier agreement, the Point Gourde principle could not apply. The land had some value to NRIL which was outside the narrow purpose for which the compulsory purchase powers had been sought. The ‘motive’ of NRIL in securing the land to avoid such an outcome should be used as the basis for calculating the value of the land from the perspective of NRIL. There was also much argument relating to the extent to which compensation for ‘injurious affection’ was payable under the 2006 order. Such loss results form the harm caused to surrounding land caused by the alienation of the land in question; the disruption caused by the building work; and nuisance type problems which may result from using the infrastructure in the years to come. The 2006 order was purely designed to secure access to the site for the purpose of maintaining the shaft and did not make express reference to injurious affection. As noted above, at one point there had been plans to use compulsory purchase powers under the 2003 order (which contained general powers relating to the west coast mainline modernization programme as a whole) to facilitate the construction of the shaft; this does refer to injurious affection. However, in the event the powers under the 2003 order were not used and the shaft was constructed pursuant to the afore-mentioned licence agreement. Nevertheless, the claimant argued that the two orders were inextricably connected and that the 2006 order was in effect the implimention of a decision deferred from 2003 when the use of compulsory purchase powers was originally contemplated. As such the two measures should be read together and the requirement to pay compensation for injurious affection should be regarded as having been absorbed by the 2006 order. The absence of fraud meant that the claimant’s somewhat tenuous arguments relating to the need for the shafts quickly unravelled. The evidence showed that there had been realistic plans to increase train speeds and that the location of pressure relief shafts was dictated by engineering considerations. The land had no value to Network Rail other than as a pressure relief shaft; thus it’s value could not be inflated to reflect its special value to Network Rail. Moroeover, the ambition of running trains at 140 mph in the long term had not been entirely abandonned and NRIL were still working towards resolving the signalling difficulties. In this respect the purchase clearly fell within the scope of section 5(3) of the Land Compensation Act 1961 and there was no need for detailed consideration of the Pointe Gourde principle. 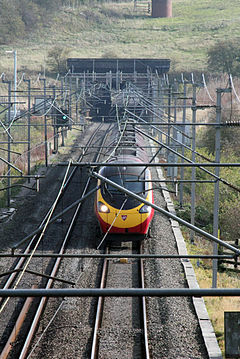 In any case, even if it could be shown that Network Rail did not need the land for use as a pressure relief shaft and other factors could be taken into account in valuing the land, there was no existing legal principle which could be used to justify taking the purchaser’s motive into account when determining compensation. ‘The significance of the dispute between the parties on this issue appears to be whether or not the claimant can, when claiming for injurious affection, have regard to train noise. That is a matter for evidence and submissions at a substantive hearing but, the parties having raised the point, I would make a provisional comment. The claimant may claim compensation for injurious affection caused by the use (but not the construction) of the pressure relief shaft. The use of the pressure relief shaft is a function of the movement of the trains in the tunnel. Its purpose is to allow the movement and release of air that is compressed by the trains. It is arguable that the airborne transmission of train noise through the pressure relief shaft is a concomitant of the use of the shaft for which a claim for compensation for injurious affection can, at least in principle, be made.’ (Para (iii)). As the above extract indicates, this issue will have to be resolved at a future hearing. The Lands Tribunal categorically rejected any suggestion that NRIL had acted in anything other than a fully above board and honest manner. Compensation was paid strictly in accordance with the legal framework establishined by the relevant legislation. Nevertheless, the claimant was clearly dissatisfied with the settlement and, despite his apparrent lack of legal training, felt compelled to explore the darkest recesses of the law relating to compulsory purchase in an attempt to find an alternative basis for assessing his claim. It is doubtful that this will assuage the CLA and similar groups although it is more generous than what was on offer before. In any case, it is doubtful that these market value based approaches would address the frustrations faced by farmers, such as Mr Miller, who lose awkward and isolated plots of land. As noted above, the market value of these isolated plots, alienated from the surrounding land of which they form a part, is very low to start with and it is doubtful whether even an uplift of 30% would make any practical difference. The inconvenience stems from making the land more awkward to farm. However, to some extent compulsory purchase has to follow a ‘one size fits all approach’ if it is not to collapse under the weight of its own complexity. Where a development causes specific access difficulties, such as severing land, provision needs to be made for underpasses and bridges and so forth. It is more difficult to factor in the additional cost and time of ploughing, sowing and harvesting around a new piece of infrastructure sitting in the middle of a hitherto uninterrupted field.